Published Nov 8, 2013 by Addison-Wesley Professional. Part of the LiveLessons series. Lesson 1: The Basics of Python In this lesson, students go over some of the basics of programming with Python. They are introduced to their development environment, learn about storing information, and use some basic logic. They also learn how to get information from the user, and how to repeat code more than once. Lesson 2: Advanced Concepts In this lesson, students learn about some more advanced programming techniques. They group code into functions, use dictionaries, and learn how to create objects in Python. Lesson 3: Designing and Extending Python In lesson three, students learn how to extend their programs and make them easier to maintain. They'll use Python modules to make their programs more powerful, then split programs up into multiple files to make the code easier to reuse. Finally, they'll add documentation so that their code is easier to work with down the road, or by other developers. Lesson 4: Working with Data In this lesson students learn to work with data. First, they learn how to open and write to files. They learn how to use JSON to make sharing data easier, and they learn how to use databases to store more complex information. Lesson 5: Making Applications In this lesson students are introduced to two ways of creating applications in Python. The first, Flask, can be used to create dynamic webpages. The second, PyGame, can be used to make desktop applications as well as, obviously, games. Lesson 6: Beyond the Code In this lesson, students develop some skills outside of writing code, and start to think about what they want to do next. First, they go over how to save their code properly by using versioning. Second, they go over how to troubleshoot their code. Finally, they go over projects that might interest you and places where you can learn more about Python and coding in general. Lesson 7: Case Studies In this lesson, students review two fully-function applications. In one, they'll be using databases, input and output, and formatting to create a classroom minder. In the other, they'll be using PyGame, objects, and modules to create a card game. 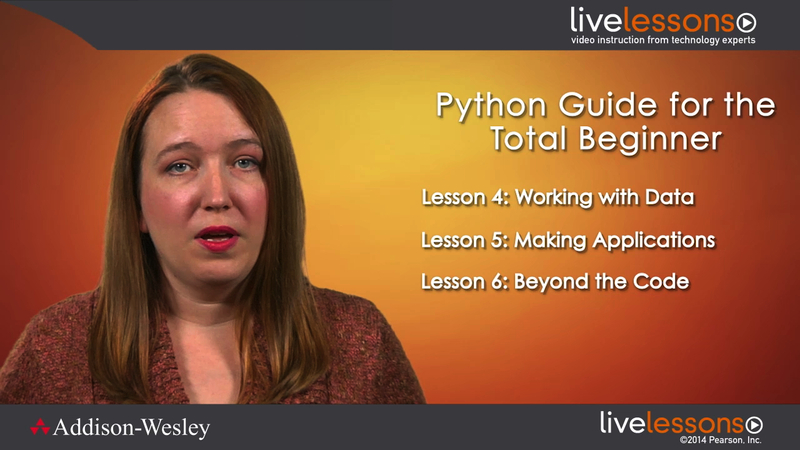 Python Guide for the Total Beginner LiveLessons is an introduction to programming in Python. Students will learn not only about the basics of programming and how to work with Python, they will delve into advanced concepts, such as object oriented programming, working with database, developing for the web, and creating games. Katie Cunningham is a Python developer and author of Teach Yourself Python in 24 Hours. She's a frequent teacher, not only at conferences, but at events geared towards improving diversity in the open source arena and increasing the number of children exposed to programming. The lessons are split into six parts. In the first, Python is installed, the student is introduced to their development environment, and some programming basics are introduced. In the second lesson, students are introduced to object oriented design, and are taught how to make custom data types in Python. In the third lesson, program design and documentation are discussed, and in the fourth, students learn about various ways to deal with data. The fifth lesson introduces the student to web and game development, and the sixth lesson talks about the proper way to save code, how to fix bugs, and what the student can do now that they've learned the basics of Python. The final lesson is two case studies, where the code behind two fully-functioning programs is reviewed.